It was so nice to wake up after 8:00 am today and not have to go anywhere! What luxury! This is what I've been doing today while the kids play. 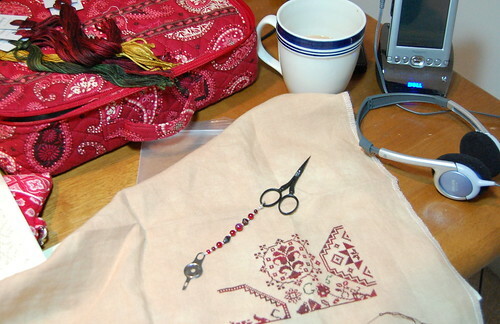 Stitching, listening to my book and drinking coffee! :) I've been working on Quaker Christmas some. I hope to get at least one motif finished up today. We found several cute places to rent. We're going to look inside some of them on Friday. Hopefully we find one that we like. I'm getting excited! Thank you to everyone for your kind comments on Sampler Lady! Write later! Glorious colors! I love it! What a lovely setting - can I join you? Zack is constantly needing my attention so I only get to stitch when he naps or in the dark of night. LOL I do stitch when he's playing in the playpen here and there but he is out and about most the time and IN TO EVERYTHING. Ah, that stage :) Your stitching on QC is lovely and a matching fob too!! Vacations are so great in that they support liesurely stitching. Enjoy. QC is working up quite nicely. Quaker Christmas is looking lovely so far. Your house hunting sounds exciting - tell us more along the way. I absolutly love the colors you are using on Quaker Christmas.Beautiful! Good luck on the house hunt.Hope you come across something wonderful. Now you know why I like being retired! Love your Quaker Christmas - what fabric and floss are you using? What a stunning start you've made on this beautiful design! Lovely to see your progress on Quaker Christmas. I'm hoping to start this next week in place of JN Queen of the Needle. QC is looking good. I like the switch between the red and green. I now have it started. 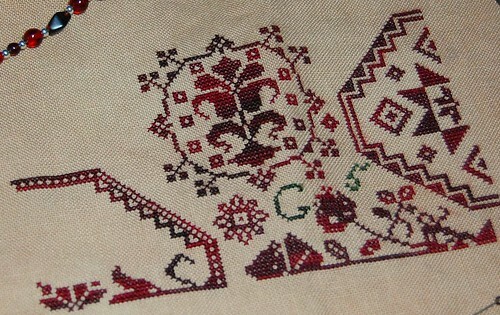 It is such a fun stitch. Are you left-handed? You always start your designs from the bottom. I usually start at the top left corner. Jus curious. I had to pull up this post to tell you that you inspired me to try audiobooks one more time. I've always loved the idea of them, but when I tried in the past to listen to them... it was awful. Audiobooks and working out didn't work either. Again, I need upbeat music to keep me moving. I was so "bored" that I just wanted it to be over with. So, I routinely saw in your posts that you listen to audiobooks while stitching. When I saw this post in particular with your PDA in the photo, something clicked. The past few days I have been listening to A is For Alibi by Sue Grafton while stitching. I have to admit that this seems to be the way for me to enjoy audiobooks. It seems that I never have enough time to do all the things that I love to do, so I have to thank you for inspiring me to give the audiobooks one more try. And I apologize about the length of this comment.